Dutch scientists are making progress in their quest for petri dish pork - pork muscle grown in vitro for meat. Just cast your eyes on the delicious photomicrograph shown below, which displays pork grown from stem cells in all its porcine glory. The muscle fibers are seen diagonally from lower left to upper right. 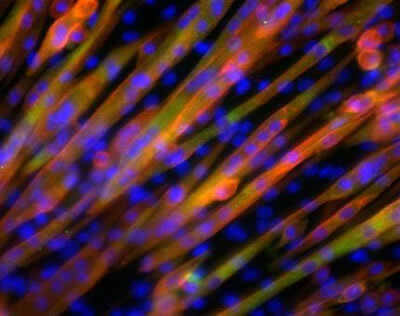 The blue dots are the nuclei of the cells, the yellow color is the result of an overlay (green and red) of two of the most important proteins in skeletal muscle, actin and myosin. Dutch scientists have been growing pork in the laboratory since 2006, and while they admit they haven't gotten the texture quite right (the lab-grown meat has the consistency and feel of scallop), they say the technology promises to have widespread implications for our food supply. "If we took the stem cells from one pig and multiplied it by a factor of a million, we would need one million fewer pigs to get the same amount of meat," said Mark Post, a biologist at Maastricht University involved in the In-vitro Meat Consortium, a network of publicly funded Dutch research institutions that is carrying out the experiments. SF fans have been salivating for in vitro meat since at least as far back as 1961. In his affable novel Four-Day Planet, H. Beam Piper wrote about carniculture, which provided meat without animals. Modern-day fans have been enjoying the exploration of this topic presented in works like Margaret Atwood's excellent 2003 novel Oryx and Crake; see the description of ChickieNobs for a mouth-watering look at chicken production - sans chicken. Via Physorg; thanks so much to the anonymous reader who tipped me off to this story.